When I was CEO of Select Registry, a portfolio of more than 300 upscale inns, we administered a secret-shopper, 200-point inspection of the guest stay. 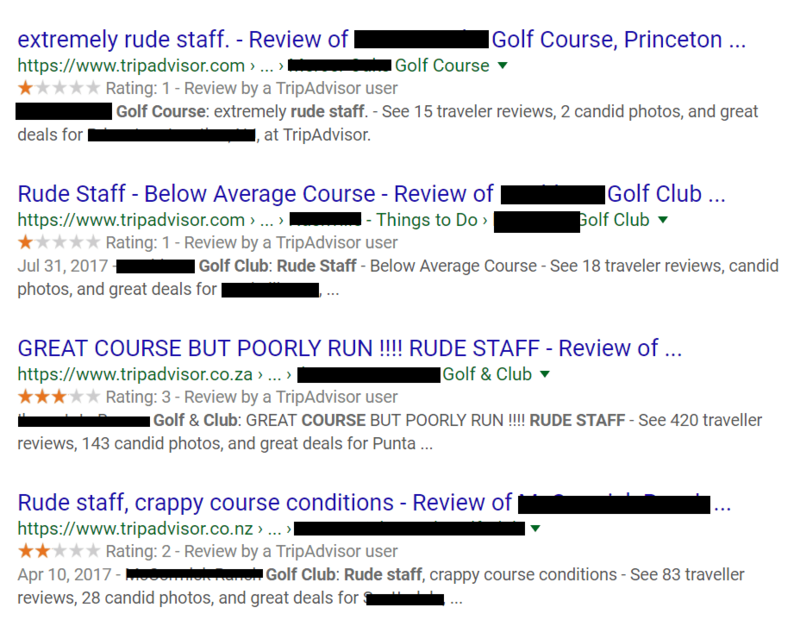 We knew a thing or two about the customer experience and what guests liked, loved, tolerated and hated. One thing I learned was the power of “dissatisfaction triggers,” which are arguably more impactful to the experience than those things people loved and wanted to experience. Examples might be finding a hair in the bathtub or being treated rudely by staff. We had a lot of first-timers stay at inns and B&Bs, which meant thousands of customers going through our doors looking both for reasons they should love this and reasons why this might have been a bad choice. I believe first-timers in golf do the same thing. They’re already nervous, they fear embarrassment and wonder if they’ll fit in. They know how passionate people are about the game, so there must be “something” really great. At the same time, they’re hypersensitive to their surroundings and how people are treating them—both other golfers and the course staff. Treatment by staff may be one of the biggest influences on customer experience. Just look at online reviews for the harshest responses. Many of golf’s leaders are asking more and more these days what we can do about the experience that will help retain more customers. We’ve focused so much on player development programs, grip-and-stance, expecting proper etiquette toward the game from people who might not get why that’s important and so on. I wonder what will happen if we turn our attention—collectively as an industry—to etiquette toward the customer and eliminating the dissatisfaction triggers. And this is tricky, because as small business owners, you know what the customer wants or desires varies depending on who walks through the door. But we often shape our businesses around the experienced customer and what they want, rather than the interested, new customer and what they may need. In golf, we should challenge ourselves to identify the triggers at the course that cause people to have a visceral reaction about golf. So much of this comes down to simple hospitality. We must remember all businesses should be hospitable, but we in golf are in the hospitality business. Do you have meaningful training with all of your staff about the do’s and don’ts of good hospitality? Did you genuinely express an appreciation for your customer’s business today? It’s no coincidence the NGCOA is focusing more time and attention on delivering hospitality and customer service content to our members through webinars and conference workshops. Did you miss the webinars we hosted this summer on hospitality? Tell me, what do you believe are the strongest triggers of dissatisfaction, which leads to attrition? And what can we do about it? Let’s close the back door and embrace the people who chose to come through the front. Good one Jay! Thank you for your thoughts. As someone who has inspected hundreds of inns, hotels and bed and breakfasts in the U.S. and Europe over the years, I would agree with Jay on ‘reputational management’ of golf clubs and ultimately ‘hospitality’. Service goes hand in hand with so many industries globally and perhaps we might grade clubs with some form of ranking like…worst overall service and conditions as terrible being a ‘double-bogey’; bad service and average conditions as a ‘bogey’; satisfactory as a ‘par’; ‘birdy’ as good; ‘eagle’ as very good and ‘albatross’ as excellent! Good stuff Jay. So many people want to work at a golf course because they like playing golf. We need to make sure they like serving people. Well done Jay, this was a great read! A few of us are transplants from the hospitality-hotel-restaurant industry. Over the past several years we have taken the basics from that industry and applied them to our course. What is our take on the strongest triggers of dissatisfaction? The most important one would be the experience of the golf course before the guest even steps foot onto the property – the reservation experience whether it be online or over the phone. If the guest schedules a tee time online, we make sure they get friendly email confirmations and reminders (not too many though.) If the guest reserves over the phone, we have scripts for the staff – but we encourage them to let their friendly personalities shine through in their dialogue with the guest. If any of the two fail to deliver, then the golf experience for the guest already started off on a bad note. There are other triggers obviously. This post was on point Jay! As our season starts to wind down I will share this post and the webinars with our staff. Great opinion piece. In the market place at this time in our economy kindness may get you more than snobbery and the unsmiling service. In my experience I have noticed that the more toney clubs feel that an attitude is required. My forty years in the hotel industry taught me that graciousness and a willingness to help saved my job or someone else’s. Later as an owner it saved my reputation when something went wrong. Association classes always helped me grow and definitely kept me humble. Thanks for the good work and keep up the good work. We are proud of you.